Have a vegan guest this Easter? Do not panic. Here is a vegan recipe that will be sure to impress. To make the filling, heat the oil in a large, wide-based non-stick saucepan or sauté pan and gently fry the onion, celery and leek for 5 minutes, stirring regularly. Add the mushrooms and courgette and cook for a further 5 minutes, or until softened and lightly browned. Stir in the garlic and cook for a few seconds more. Add the carrots, tomatoes, drained lentils, 300ml/10fl oz water, wine (or extra water), tomato purée, yeast extract, mixed herbs and crumbled stock cube. Season with salt and pepper and bring to a gentle simmer. Cook for 30 minutes, or until thick. Stir occasionally at the beginning and more regularly towards the end of the cooking time so that it doesn’t stick. Add a little extra water if necessary; it should look nice and saucy, but thick enough to support the weight of the potatoes. Adjust the seasoning to taste, making sure you are generous with the black pepper. While the vegetables are simmering, make the mash. Put the potatoes in a large saucepan and cover with cold water. Bring to the boil, then reduce the heat slightly and cook for 15 minutes or until very soft. Drain the potatoes in a colander then return to the pan and mash with the almond milk, oil and nutritional yeast. Add a little more milk if necessary, so that the potatoes are really light and fluffy. Season with salt and pepper. 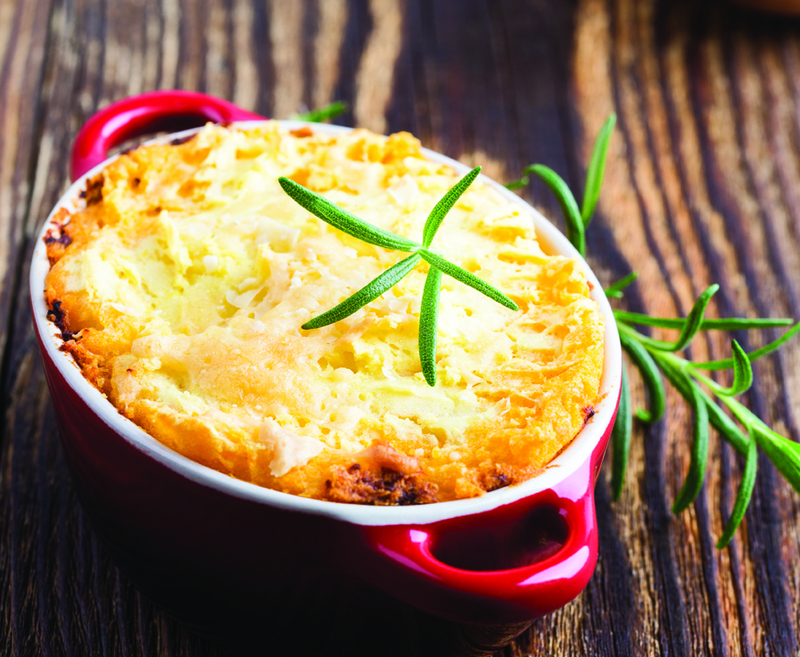 Pour the lentil mixture carefully into a 2.5 litre/4½ pints ovenproof dish – a lasagne dish is ideal. Spoon the potatoes gently onto the filling and fluff up the surface with the back of a spoon. Bake for 30 minutes, or until pale golden-brown and bubbling. If the topping doesn’t go brown enough, pop under a hot grill for a couple of minutes. Serve hot.